We’d love your help. Let us know what’s wrong with this preview of The Old-Fashioned by Robert Simonson. A complete history of one of the world's most iconic cocktails--now the poster child of the modern cocktail revival--with fifty recipes for classic variations as well as contemporary updates. No single cocktail is as iconic, as beloved, or as discussed and fought-over as the Old-Fashioned. Its formula is simple: just whiskey, bitters, sugar, and ice. But how you combine tho A complete history of one of the world's most iconic cocktails--now the poster child of the modern cocktail revival--with fifty recipes for classic variations as well as contemporary updates. To ask other readers questions about The Old-Fashioned, please sign up. Well! Thanks to Mr. Simonson I certainly know more about the Old-Fashioned than I ever did before! But what a load of facts there are about the simple and humble predecessor to all cocktails. So much to know about a simple mixture of spirit-sweetener-bitter. I could barely put this book down, truth to tell. I've wanted to be an Old-Fashioned drink Well! Thanks to Mr. Simonson I certainly know more about the Old-Fashioned than I ever did before! A classy little book about my favorite cocktail, half history, half recipes. Admittedly, being a native Wisconsinite*, I lean towards the Brandy Old-Fashioned (sour, preferably), but the recipes provided from some of today's neo-cocktail artists tempt me to try some new twists. The photos are lovely, and the author clearly has a passion for the drink. He goes through the history without getting dull or too pedantic, though he seems to be a bit puritanical when it comes to putting fruit in the gl A classy little book about my favorite cocktail, half history, half recipes. Admittedly, being a native Wisconsinite*, I lean towards the Brandy Old-Fashioned (sour, preferably), but the recipes provided from some of today's neo-cocktail artists tempt me to try some new twists. The photos are lovely, and the author clearly has a passion for the drink. He goes through the history without getting dull or too pedantic, though he seems to be a bit puritanical when it comes to putting fruit in the glass. But how could it be dull? We are talking about a classic cocktail from the late 1800s, so its story would of course be as varied and fun as the decades it's lived through. Compared to most of my friends, I am nowhere near being a mixologist. I openly admit I only started drinking this cocktail because it was the drink of choice for Mad Men’s leading man Don Draper. Thankfully, “The Old Fashioned” acknowledges I’m not alone. “The Old Fashioned” book has two ingredients: It starts with the lore and ends with the recipes. Simonson, whom is probably the foremost expert in The Old Fashioned and therefore has the coolest job in America, journalistically traces down the h Compared to most of my friends, I am nowhere near being a mixologist. I openly admit I only started drinking this cocktail because it was the drink of choice for Mad Men’s leading man Don Draper. Thankfully, “The Old Fashioned” acknowledges I’m not alone. I would really rate this around 3.5 but it stems from the poor editing job and a lot of the recipes I will never utilize. I am definitely a part of the school that enjoys a classic Old-Fashioned that does not incorporate a lot of fruit. If you read this book, you’ll understand a lot of the little nuisances. The story is interesting and wish there was more to it. This is a very informative, handsome book. It gives a well-researched history of the Old-Fashioned with cultural context and then provides recipes from across time and the world. It tackles the all important issue of fruit and does so in the best way possible. The recipes all have explanations and offer substitutions to ingredients that may be difficult to find. When it comes to Irish Whisky I prefer Powers or Paddy to the overly marketed Jameson. When it comes to Rye hands down the only option is Bulleit rye—at least in the states. There are a whole myriad of reasons I prefer Whisky to Rye in a public forum, ranging from cost, to the blatant abuse of the Old-Fashioned by young, 20-something-scholarship-toddler-bartenders, to availability; though powers is really difficult to find in Boston bars. Because my tightly held opinion over the composition of the Old-Fashioned is unwavering, this is often a drink I make in the comfort of my own apartment. I am really controlling, as you may have noticed. My public drinking habits have infiltrated casual home drinking, and thus my Old-fashioneds always contain Powers. I can’t tell you how I developed this pattern of Old-Fashioned drinking, however, I can say with certainty that it was my transition from a college wasteland of vodka —crap vodka—and trendy drinks. I then ventured to Scotch without even realizing it. I ordered it in excess in Canada and fell into the arms of Johnnie Black—apparently some strangers as well, however I was told they were all very fit lads—throughout an entire weekend, and then if I recall fell into a tub in my flat, lost my pants somehow and my underwear, and eh, maybe a bit of pride (not likely). And, Scotch makes its exit. Following the simple directions of muddling bitters and cube, NO WATER EVER! I was told to then put a hunk of ice in it and give it a around about in the glass, pour in the liquor, twist the orange, drop and savor. The brilliance of this book is its approachability. The point of me telling you the lengthy bla bla bla of my drinking escapades is to emphasize that I too, after years of perfecting my own old-fashioned recipe—and a side of prudishness—can suspend my drinking pride and get into this book. Oh and sooo sooo much more. This Book reads like a Mary Roach novel. It is clever, maybe not as funny in the traditional sense but will still instigate a few laughs, and the facts are endless and incredibly insightful. Unlike your traditional and recklessly put together liquor recipe book, this one offers the recipes, along side a fairly lengthy explanation of its origin or the selection of liquor, and often both. What’s helpful here is that it offers a myriad of options, even in terms of the new recipes that the opinionated drinker will have a tizzy over—like myself. I highly recommend this book to those who cherish this simple and delightful drink, but ALSO those who just want a quick, comprehensive outline of the history of the cocktail, its origin, and why the Old-Fashioned reigns supreme; and there we have the cockiness. Awesome book. Beautiful photos and layout. The first half of the book is a relatively brief, but interesting, informative, and nicely written history of the Old-fashioned cocktail. The second half is a wealth of drink recipes from famous bars and bartenders, that appear to ones I will certainly test out. The ironic part is that most of these recipes are not Old-Fashioned drinks, but rather Improved Cocktails. As the book itself points out in the first half, the "improved cocktails" were a result Awesome book. Beautiful photos and layout. The first half of the book is a relatively brief, but interesting, informative, and nicely written history of the Old-fashioned cocktail. The second half is a wealth of drink recipes from famous bars and bartenders, that appear to ones I will certainly test out. The ironic part is that most of these recipes are not Old-Fashioned drinks, but rather Improved Cocktails. As the book itself points out in the first half, the "improved cocktails" were a result of taking the basic cocktail formula one step further by adding sweeteners other than plain sugar. Once the "improved" cocktails took off, the return to the original cocktail formula using plain sugar was what led to the creation of the Old-Fashioned drink's name. 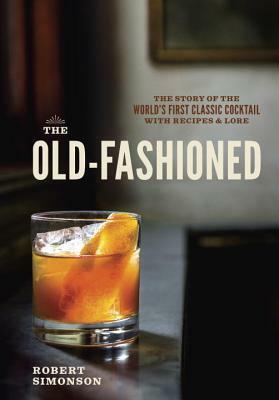 A visceral history of the old fashioned, with plenty of back stories and recipes to tempt the tastebuds. Robert Simonson provides the reader with an accessible intro to the Old Fashioned cocktail. He researches various inventors and innovators, and describes a short history of the drink. The second half of the book is dedicated to the classic and modern variations on the recipe. It simply requires whiskey, dashes of bitters, a citrus garnish, and sometimes a syrup. It even includes experiments with rum, gin, and tequila. At first I thought this was a glorified pamphlet because the book proper is less than half the length and the rest is taken up by recipes. Upon closer examination, I discovered that those recipes tell a story of their own. They run the gamut from the very first Old Fashioned to some that the author himself created. This is a fun and interesting read that is also incredibly quick. A solid book on a subject near and dear to my heart (and my liver). The histories are interesting, and the recipes, variations, anecdotes, and weird drinks people somehow manage to still label as an "Old Fashioned" are a nice bonus. Whiskey (preferably rye), water, sugar, bitters, a big ice cube, and maybe a twist of lemon or orange. Anything else is barbaric. Delightful historical perspective coupled with a breadth of recipes for stirring up an Old Fashioned. The photography is inviting , one almost feels the warmth of the whiskey. a book all about my favorite cocktail. yeah! If you are interested in Cocktail Lore, combined with cocktail variations in a well-written, attractive package, I don't see how you could do better than this book Exactly what I wanted.